The Building Digest: What is Window Condensation? After the frigid winter, I'm sure everyone has experienced this at least once. 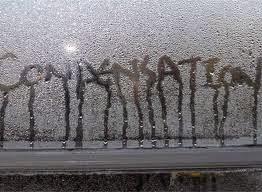 Condensation on the interior glass of your windows. Does this mean your windows are bad? Watch this video by Andersen Windows for a brief explanation as to what causes window condensation, and how to minimize or eliminate it. deteriorate the finish on the inside of the sash, and could possible cause premature rotting of the sash. Keeping them dry, or maintaining the finish will help keep your windows performing well, and looking great! Keep in mind, that if the condensation is BETWEEN the panes of glass, then yes - the seal between the windows has failed and it's time to call a professional to replace the glass or sash.